I remember going to an East Stirlingshire v Clydebank match at Brockville Park in the early 1980s due to there being a problem with Shire central, it is interesting to watch League matches at neutral venues, there is an unnatural feel about them, none of the vie wing public being completely at home; and the odd neutral [like I was] being unfamiliar with both teams. Of course games like this used pop up every so often, but they were mainly to do with the ground being used for another match, and nowadays would be more likely to cause a postponement than moving to another ground. 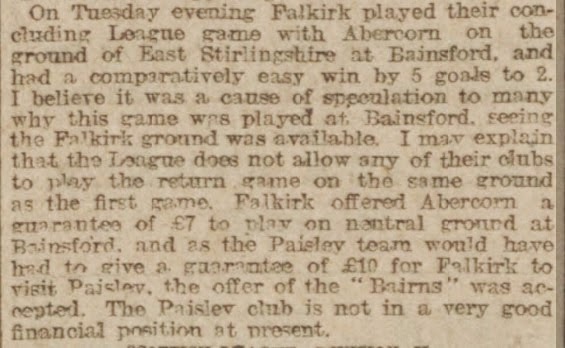 But the match brought to mind reading about an Abercorn v Falkirk match which was played at the home of East Stirlingshire, Merchiston Park on the 3rd May 1904. Completely different circumstances of course and in this case it was technically an Abercorn home match, but it is close enough to bring a wry smile to my face.